On June 10th in 1943, Laslo and Gyorgy Biro were granted US Patent 2,390,636 for their invention of, you guessed it, the ballpoint pen. 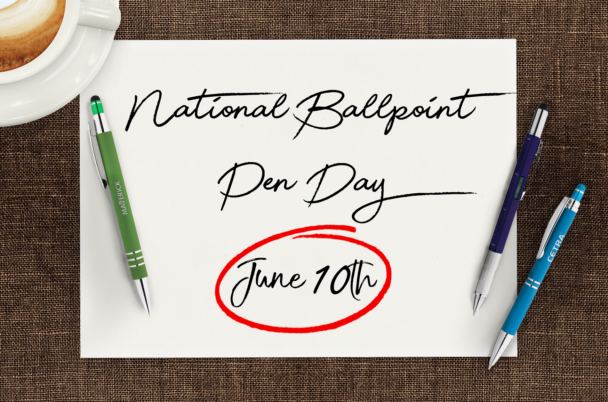 Now we recognize that day to celebrate the Biro brothers and the birth of the ballpoint pen. At the time, these stylish writing instruments with quick-dry inks were the tools of the rich. Now a ballpoint pen is an affordable must-have for everyone. The Celena Stylus Pen combines a soft-touch barrel with a stylus for touchscreen navigation, so now you don’t even need to have paper on hand to jot down important notes! Similarly to the Celena Stylus Pen, the Hexam Soft Touch Stylus Pen features click-to-write action and a color-matched rubber stylus at the back end. For extra comfort, it adds a soft grip that’s gentle on your hands and has a detailed diamond design engraving. The 7 Function Tool Pen that can be used to write, work your tablet, measure, or level, and also contains hidden flat-head and Philips head bits. It’s the perfect way to make sure your clients and prospects always have your brand on hand! That’s just the beginning! There are hundreds and hundreds of styles, colors, and options that can be customized. If you’re not sure how to pick the perfect pen, check out our Pen Buying Guide to help you make the right decision. Myron carries a variety of unique and standard promotional items for any and every brand. From pens to tech, calendars to bags, you can keep your brand at your customers’ fingertips with high quality, affordable promotional items from Myron.